Within Teamwork Projects you have the option to enable the Harvest integration to track time on your projects. Click on your profile icon in the top right of your site, and select Settings from the dropdown menu. 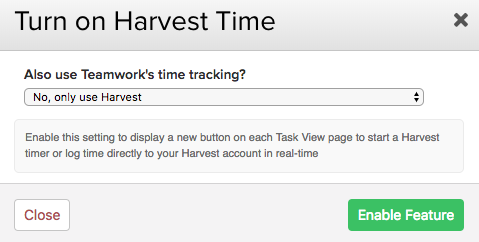 In the Integrations tab, you will see a section for Harvest Time Tracking, and an option to enable. Once you have enabled this from the site settings you can then choose which project you would like it enabled on. Go to the project you want to use the Harvest Timers on, and select the Settings tab. In the section for Harvest Time Tracking, toggle the switch on (green) to enable it. When enabling this on a project you have the choice to use only Harvest timers or both Teamwork and Harvest timers. Once you have enabled the integration on your project, you will see a Harvest button in the top right of the task details view. A new time icon will also appear inline with tasks in the task lists. Note: If you use the Harvest timers, the time cannot also be logged to the time area on the project.